Okay we are here at a beautiful historic home in Toronto and they’re having a couple of roof leakage problems. We’re going to go up top on the roof and make a good roof inspection and see what needs to be done. So we’ll see you on top. Okay so we’re on top of this historic home and the first thing we notice is it’s a ten twelve pitch or so, maybe a little steeper. This would be considered un-walkable by most folks, and rightly so. The next thing we notice are the pipe collars or cracking and when the roofer did this roof they re-roofed over the existing shingles and didn’t replace the pipe collars. We see that quite often. It’s not a great thing to do. Okay we’re on the peak looking down and we’re noticing some regular things like nail pops. There’s a nail top right there, and there are several on the top. So we’ll take care of those. 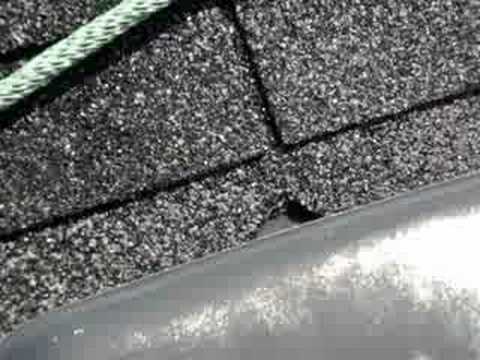 There’s a missing shingle down there starting twist sideways, so we will check all those and make sure they’re okay. We did notice a little crack in the flashing at the corner. That copper work is pretty nice. We will that little hole. This is where we found a little leak. There’s a little crack on top of where the bathroom fan is mounted. We’ll take care of that. There’s little bump out dormer section on the back here and that’s nice because it’s easy to walk on even though it’s three stories up. And you can see the wind has pulled some of the shingles off. There’s one that has pulled back. There are a couple down there at the end. We’ll take care that. That’s kinda normal being so high and being that the wind has a little direct advantage on picking those shingles up. There’s another pipe collar down below that need replacing. Of course that’s an old one, and it’s cracking and rusted.